(l to r) BOB FRAZER (Jay Gatsby), AMY RUTHERFORD (Daisy Buchanan), CELINE STUBEL (Myrtle Wilson), CRAIG ERICKSON (Tom Buchanan). Photo by Trudie Lee. In one of the last scenes of Theatre Calgary’s production of Simon Levy’s adaptation of The Great Gatsby, the privileged and shallow Daisy Buchanan tells Jay Gatsby that she cannot be with him because the fantasy perfection of their love has been marred by reality. “I wanted it to be beautiful,” Daisy tells Gatsby as an excuse for going back to her cheating husband and unhappy marriage. In far too many ways, Daisy’s words are a metaphor for Director Kim Collier’s treatment of F. Scott Fitzgerald’s famous tale. Like Daisy’s wish, this show is overflowing with beauty onstage but like the blemishes that ruin Daisy’s ability to actually be with Gatsby, the production is beset by problems that ultimately ruin the audience’s relationship to the story. If you are not one of the twenty-five million people worldwide who has purchased and presumably read Fitzgerald’s 1925 novel, or seen one or both of the screen versions, a quick refresher. Nick Carraway, a decent young man from the Midwest, moves to New York in 1922 to try to make his fortune trading bonds. He rents a house on Long Island next to a huge mansion owned by a mysterious man named Jay Gatsby who is known throughout NY for hosting lavish, extravagant parties that everyone who is anyone attends. We eventually learn that these parties, his amazing house and in fact all of Gatsby’s wealth and success has all been designed to impress Daisy Buchanan , his first love and by coincidence Nick’s cousin. Daisy used to love Gatsby when they were younger, but Gatsby went off to war and Daisy ended up marrying Tom, a fabulously wealthy, old moneyed, brute of a man who has affairs on her left right and centre. Tom’s most recent fling is a working-class married woman named Myrtle. Nick helps Gatsby reunite with Daisy and it looks at first as if they will get back together, but Daisy backs out at the last-minute and ends up killing Myrtle by accident in a hit and run as she’s driving back to the home she shares with Tom. Myrtle’s husband comes to believe that it was Gatsby who was Myrtle’s lover all along as well as the one who killed her, so he tracks Gatsby to his house and shoots and kills him. 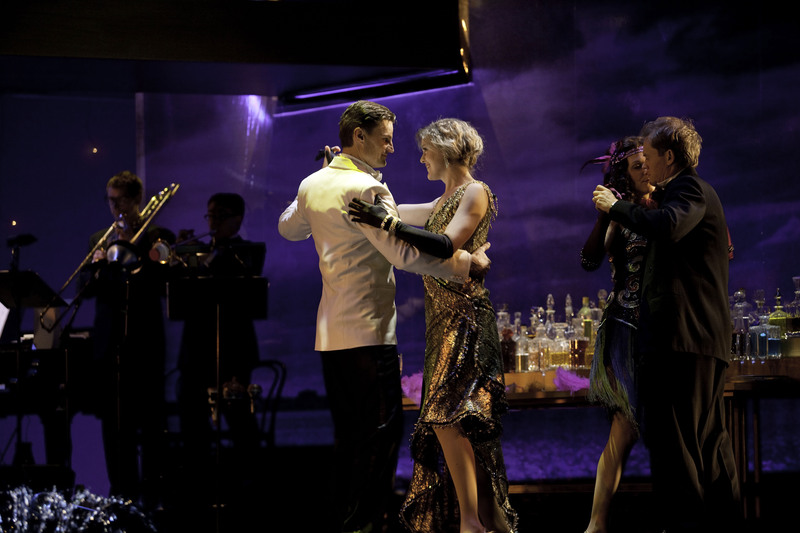 The production’s fatal flaw, aside from Director Kim Collier’s safe presentation that offers nothing unique or exciting in the telling of this story, is the dynamic between Nick and Gatsby. To put it simply, Gatsby (a milquetoast Bob Frazier) has no charisma or emotional authority and Nick (Jonathan Young) has too much. Gone is the awe that Nick feels for Gatsby and absent is Gatsby’s flawed but magnetic persona that keeps the audience so enthralled with his longing for Daisy’s love and admiration. The result is castration of the play’s emotional motivation, leaving it as soulless as the characters that inhabit the narrative. However soulless can be interesting when done with intelligence. Despite the despicable nature of all of Fitzgerald’s characters in The Great Gatsby, there were some intriguing performances in this production. Jamie Konchak as Daisy’s friend Jordan does an admirable job playing a successful golfer who’s real game seems to be playing a more honest person than she really is. Craig Erikson as Tom turns in a strong but somewhat confusing performance that is more unrefined brute in manner and speech than well-bred, old-moneyed cad. But it’s Amy Rutherford as Daisy who really catches our eye. It’s easy to pass off Daisy as nothing more than a vain, shallow and spoilt character, but Rutherford brings a layer of despondency and fear to the role that makes her a far more interesting character than any other portrayal I’ve seen. The more Rutherford ramps up Daisy’s hollowness, the more she allows us to see her behaviour as a pathetic cry for help. But back to the beauty of the show. Casting and character aside, there is no question this Gatsby wins us over with the way it looks. Judith Bowden’s basic set design is just steel beams with scrims and a catwalk but this allows her the use of some gorgeous projections and props/ larger design pieces inserted into each scene. Tom and Daisy’s house soars with grand stately art deco columns, Gatsby’s home gains majesty from a huge staircase and a triple water fountain built right into the stage, the Plaza Hotel in NYC is perfectly deco chic and the apartment where Myrtle and Tom meet is shabby cool with a great view of a 20’s billboard outside the window. The costumes are equally stunning with dandy suits for the men and daytime and evening flapper dresses for the ladies, many of which I’d happily pinch for my own wardrobe. All of this was complemented by Collier’s fluid and often beautiful staging which provided great visual interest even when the emotional and intellectual substance of her production waned. On a personal note, I have never been a big fan of The Great Gatsby in any of its forms. I find the story lacking in satisfying emotional motivation and all the characters neither likeable nor interesting enough to relish as despicable personas. Nevertheless, I do understand why Gatsby has evolved into the iconic story it is today and why the notion of a powerful man motivated by flawed longing for his fantasy version of a particular woman lives on in popular culture. Or at least it will as long as this production isn’t the benchmark. I would venture to guess that anyone seeing the show for the first time would have no clue as to why the image of Gatsby has become such a standard reference or why this story is considered a classic piece of American literature. What audiences will get are some decent performances and beauty that would make even Daisy Buchanan happy.